It is important not to overlook the impact that even the most basic brand promotion can have, with business cards being cited as a key marketing tool for small and larger businesses alike. Providing a pocket sized piece of marketing and promotional literature, holding important information about your business and setting the tone of your company. We offer fast turnaround times from design to print on our core print services products, and great prices too. A range of cards to suit taste and budget. The luxury 400gsm matt laminated business card is our best seller, with superior durability and unique finish, but we also offer 380mic recycled pulp business card, for the more environmentally conscious. Your business card says everything about you. Pocket sized advertising that will leave a lasting first impression. 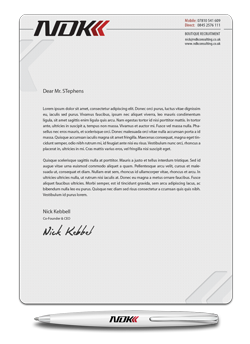 We produce a range of high quality letterheads and compliments slips, as well as appointment cards and postcards, to meet the needs of all our customers. We also offer recycled letterheads that are ideal for business in today’s eco conscious world. At Puffin Creative we use lithographic printing technology in a choice of full colour or pantones, for a superior print quality. Compliment Slips add a personal yet professional touch to your business stationery, available in a choice of two paper types: 100gsm Bond or a sturdier 120gsm Bond. We can also offer digital printing options too. For direct mail, sales, corporate events, or exhibitions, we can design and print all leaflets and flyers that you may need for your business. Carrying your company branding and designed to reflect your products and services. We can even offer a copywriting service too, making every printed word count. Flyers are basically leaflets on thicker paper! Common uses are for Tickets, Vouchers, Promotional Launches, Change of Address Cards. We can offer a variety of finishes, such as Silk, Pulp and Gloss on standard weight (350gsm) or extra thick card (400gsm and 380mic). In addition we offer flyers printed on 1 or 2 sides and also available on 100% recycled card. 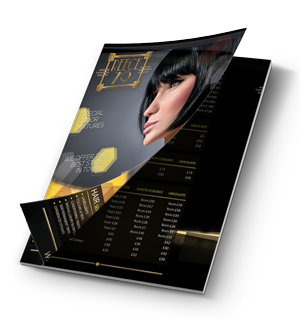 A great way to showcase your products and services, the right brochure for your organisation helps set the tone for everything you want to say. 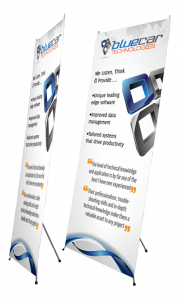 It reflects the values and services of your company in a tangible and portable way. Brochures can be used as company catalogues or as more of a concept book to outline possible services or solutions or even case studies examples. We can produce brochures in three different sizes (A4, A5 and A6), printed full colour onto 130gsm or 170gsm gloss art paper, or 120gsm recycled bond paper, then stitched in two positions on the spine. Banners, backdrops and posters, can all be designed and printed to complement your stand for eye-catching appeal, to help you stand out from your competitors. We can also produce motion graphics animation sequences for visual display units – ideal for these types of events. From business cards to display banners and all that’s in-between. 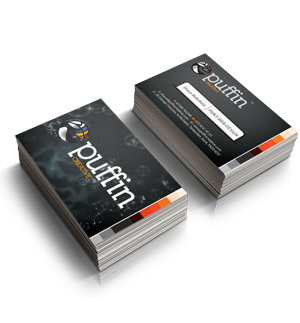 At Puffin Creative we can design and produce all printed media for your business. Consistent corporate representation throughout all of your printed material is vital to maintain your company image and maximise exposure to your customer audience. Print Services for Business Cards, Letterheads, Compliment Slips, Exhibition Banners, Flyers, Membership Cards, Leaflets, Brochures, Gift Vouchers, Postcards……and more.